It would seem that life consistently affords one opportunities to look back at the path you've walked. I do my best to embrace these opportunities, but I've often found my self slightly discouraged in the past when doing so. I would tend to review the goals I had at a period in time, then measure the progress or lack thereof and feel as if I did not make the most of the time I had. And yet in the big picture, things have gone very well. My family has had its needs met, I've enjoyed my work, and I've created. So as I get older — and wiser — I've learned to not give in to the temptation to be discouraged and focused on what has been accomplished. And not just in my work, but life in general. But I find that our industry has a problem. Success is most often measured in metrics like dollars, followers, readers, users, apps sold, or books published. And in order to achieve the metrics that equate to success, there is required a rigorous adherence to the golden egg that is the creative routine. The routine doesn't have to look the same for all, but the emphasis is on the adherence to the routine. Since Jack Cheng published his first novel, he's published a weekly newsletter where he gives glimpses of his life. This past week he shared a link to an interview he did for The Sunday Routine, a site that gives insight into the “The weekend routines of interesting people”. After reading Jack's entry, I was intrigued , having enjoyed the piece. But I came away with one thought louder than all the others: he must be so lonely! You'd have to read the article to understand my reaction. And I am fascinated with reading this type of content; getting a glimpse into the life of another and seeing how they create. What they create doesn't always matter, but I find the process a fascinating subject. I've long admired Jack's thinking, writing, and his work, but reading that piece reminded me that being inspired by the doings of another does not mean I need to do it like them. A routine that quiet, that lonely, that devoid of others would drive me crazy. And I consider myself a loner, one who greatly prefers time alone or with a couple of friends over a crowd of any sort. I treasure the quiet moments in my life, but without the contrast of a busier, noisier time each day, those moments of quiet would turn into a feeling of loneliness and potentially, despair. My knowledge of Jack Cheng is remote and I'm sure he's not lonely; like all of us, he's made many decisions to shape a life that he desires. But this type of lifestyle seems common and I can't help but wonder if we have collectively created a Holy Grail for creative routines. 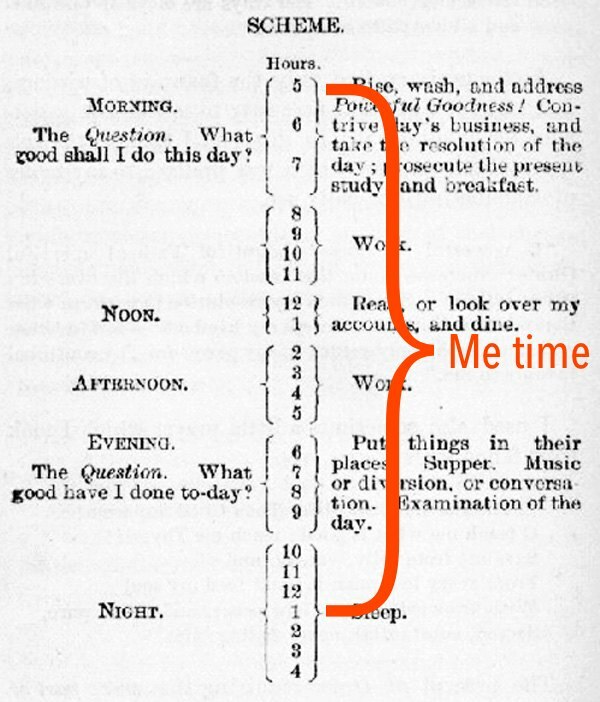 This has been highlighted in recent years with the fascination of Ben Franklin and his well known daily schedule. I've read many a blogger mention his routine and voice their admiration for his dedication. And certainly, there is much to be admired in the person of Ben Franklin and his ability to focus. Yet I can't help but see this at the same time. I know very little about the details of Ben Franklin's life, including whether he was married or had children. That schedule suggests that he did not, however. And when I see so many touting the virtues of Franklin's schedule and discipline, people who live with a family, I can't help but think we're setting ourselves up for failure. A spouse and children make that type of day impossible. And we should not begrudge them for that fact. One change I have made in my thinking is that any progress at all should be recognized. In my situation, there are days where I have 30-60 minutes to work on my personal creative projects. If I am able to write 400 words on my book, that is 400 words that were not written the day before. It’s slow progress, but progress nonetheless. With a busy life and a larger family, interruptions are a part of my day. So with all my work, whether it’s writing a book, building a woodshed, or washing the truck, learning to be patient and recognize that any progress is a success was a necessity. I have to think incrementally. There is value in discipline … this is very true for me. As an early riser who has done much of my creative work in the hours before breakfast for five years, I hold discipline in high regard. But I must give voice to the sense of caution that has been growing; to recognize the potential to hold too tightly to the sacred schedule. To keep the goal so firmly in sight that you miss many of the things that make life worth living. Being disciplined with our time is not a problem. Comparing ourselves to those with much more time for themselves is. And so is having goals for your creative work, but none for your family. When I find myself resenting the lack of time in my life for my personal pursuits, I picture Ben Franklin eating alone at the end of the day. I'd rather be slow to produce in a home filled with interruptions and noise.